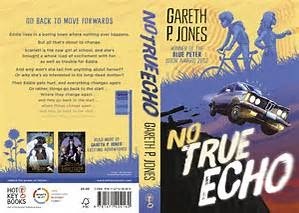 No True Echo, by Gareth P. Jones (Harry N. Abrams, Oct. 2015 in the US), is the story of an ordinary English school boy, Eddie, living a boring life with his grandmother in a boring small town in the middle of nowhere and then Bang it all blowing up into a swirling vortex of time travel madness. The catalyst that sets off the bang is the arrival of a new girl, vibrant and curious and charismatic. A new girl who Eddie wants to be friends with. A girl who is actually not a catalyst, but a reactant--there because of things done in other pasts and in possible futures. This is sci fi time travel of a fantastic sort--a machine that can send echoes of a person back into their past, allowing them to change things. 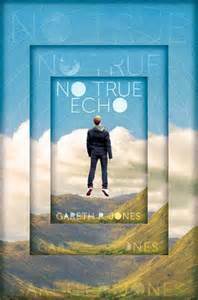 But the echo pasts live alongside the original pasts, and just what the original, real, meant to happen timeline is gets obscured. This confusion hits Eddie's timeline hard, because the new girl hasn't come to his time and his place by chance--it is the epicenter of the new time travel technology. Basically the title of the book sums up the whole approach to time travel very nicely. Eddie is about to ask questions he'd never considered, like "is my mother alive or did she die in a car accident when I was a baby?" and "will I ever see this girl I think I might love ever again." But Eddie confusions aren't all that this story is about. There was also a murder done, which Eddie is a witness to (or possibly no murder ever happened), and if it did in fact happen, justice needs to be done....and so, in a rather nice little side plot, we see bits of that story from a local policewoman's point of view, in both the book's present and in the future. And now--what does Kirkus say? (I like to compare with Kirkus because they often disagree with me and because it is easy to find their reviews). "At once a classic time-travel narrative and resonant fable about the price to be paid when we alter our world simply because we can, this smart, satisfying eco–techno-thriller with heart transcends genre." All right, that's fair enough, although I'm not sure about the "eco" part. There were some trees mentioned....possibly a sheep or two kicking around in the background...it was definitely muddy.....It's certainly not "eco" in the sense of "global warming" or "horrible drought." Sounds interesting! The UK cover looks younger, though. And retro! Wow! this one sounds good..thx for the review..I'll pick it up! Wow that sounds good !!!!!!!!!!!!!!!!!!!!!!!!!!!!!!!!!!!!!!!!!!!!!!!!!!!!!!!!!!!!!!!!!!!!!!!!!!!!!!!!!!!!!!!!!!!!!!!!!!!!!!!!!!!!!!!!!!!!!!!!!!!!!!!!!!!!!!!!!!!!!!!!!!!!!!!!!!!!!!!!!!!!!!!!!!!!!!!!!!!!!!!!!!!!!!!!!!!!!!!!!!!!! !